Why do we need a global financial safety net? 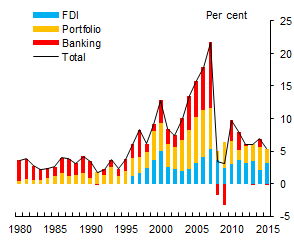 The past three decades have witnessed significant growth in cross-border financial flows. Between 1980 and 2014, the stock of external liabilities grew from 30% to 180% of global GDP. Global gross flows of capital were $4 trillion (5% of global GDP) in 2015 (Chart 1). And Chart 2 shows that foreign-currency denominated bank liabilities globally increased from less than $6 trillion in 1990 to over $20 trillion today. This structural shift, in theory, can bring great benefits. Resources can be allocated more efficiently. Risks can be shared across borders to the investors best placed to shoulder them. And knowledge and technology can transfer along with financial flows. But, as the global financial crisis has shown, these flows are not without risks. 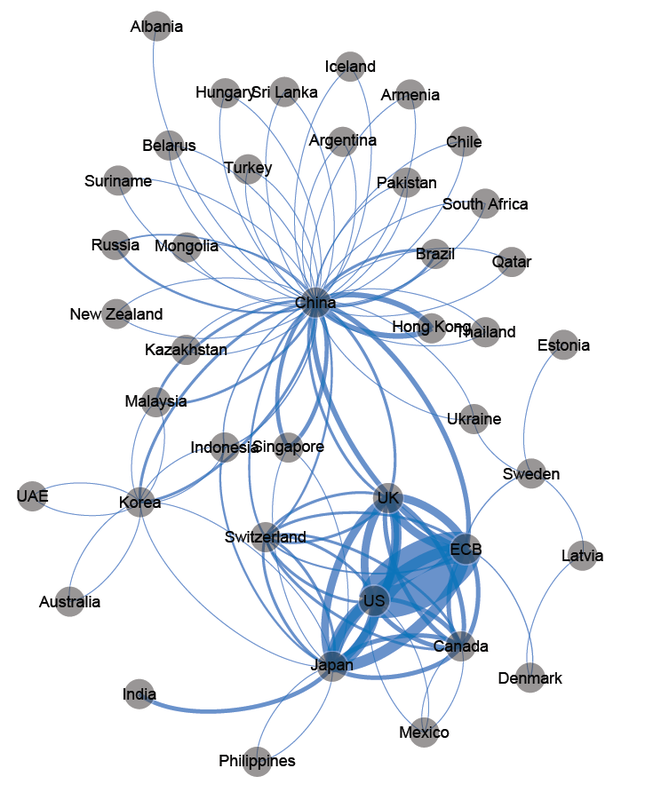 Cross-border capital flows expose countries to the risk of a balance of payments crisis either from a sudden stop in capital inflows from foreigners or from capital flight by domestic residents. Foreign currency borrowing by banks and corporates exposes them to the risk of a foreign currency liquidity crisis. And governments are exposed to the risk of a sovereign debt crisis, especially where public debts are high, fiscal deficits are at unsustainable levels, and the government relies heavily on foreign investors. The first line of defence against such shocks is robust domestic macroeconomic, and micro- and macro-prudential policy frameworks. Such frameworks can reduce vulnerabilities building on national balance sheets – indeed since the 2007/08 crisis, the extensive financial regulatory reform agenda has made the global financial system much safer. But when crises do occur, access to external sources of foreign currency liquidity can help limit disruption. An effective GFSN ensures early financial support to prevent liquidity crises from escalating into solvency crises and local balance of payments crises from turning into systemic sudden stop crises. Historically the GFSN was made up of countries self-insuring through foreign exchange (FX) reserves, with the IMF providing a global external backstop. This was supplemented by some small regional financing arrangements (RFAs). In the years prior to the global financial crisis, the external resources of the GFSN were in decline relative to the scale of global external liabilities (Chart 3). 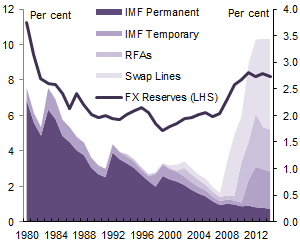 The crisis saw an unprecedented increase in total resources with central banks arranging bilateral swap lines, existing RFAs increasing their resources and new ones being set up, and the international community agreeing to triple the IMF’s overall resources, with increases in both its permanent quota resources, and additional temporary resources borrowed from members. The rest of this section shows how the instruments of the GFSN have very different characteristics, are suitable for different types of crisis and are unlikely to be completely substitutable. 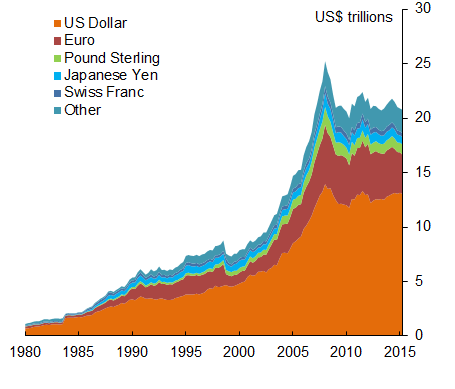 Globally, there are over $10 trillion of FX reserves. They are an excellent first line of defence, providing holders with immediate access and can be flexibly deployed for any purpose including to meet balance of payments needs and to provide foreign currency liquidity to domestic banking or corporate sectors. But reserve accumulation has several downsides to both the holder and globally. For example, they are costly to accumulate, are distributed unevenly, their extensive usage can send negative market signals and their accumulation can lead to distortions to domestic economies with spillovers to the global system. Many countries now have access to central bank swap lines (Chart 4). The provision of US dollar swap lines by the Federal Reserve in 2008/09 played a significant role in reducing pressures in global dollar funding markets. But extending swap lines is constrained by central bank mandates which are focused on domestic macro-economic and financial stability. Justifying a swap line often requires there to be the risk of spillovers from problems in the borrower’s financial system back to the lender’s. This limits the potential availability of swap lines, in particular from reserve currency issuers. Sources: Central bank websites and author calculations. Note: A link between two nodes indicates the existence of a swap line. Two lines means that the swap line is reciprocal. The thickness of the line represents the size of the swap line. The rise in RFAs is one of the big evolutions of the GFSN – there are now eight major RFAs, with total resources of around $1.3 trillion. They provide additional resources to prevent regional spillovers and add additional surveillance expertise. However, pooling risk at the regional level may be ineffective against the regional systemic shocks which have been common in the past. And many RFAs remain untested and their coverage is patchy with many countries not a member of any RFA. There are advantages to combining country surveillance and lending in one global institution, with an impartial and experienced staff. And risks are most efficiently pooled at a global level. The IMF has $1.3 trillion of resources (of which $970 billion is classed as lendable) and sits as the ultimate backstop to the international monetary and financial system. Earlier this year, IMF members ratified the most recent review of quotas (the IMF’s permanent resource base which also determines members’ voting shares). This doubled the IMF’s quota base, helping to put its resources on a more sustainable footing. It also reformed the institution’s governance arrangements including by shifting voting share to emerging market economies (EMEs). But even after these changes, over 50% of the Fund’s resources are temporary and due to expire over the next two years, putting its future lending capacity at risk. Is the global financial safety net adequately resourced? We applied a series of external balance sheet stresses to estimate potential calls on the GFSN. For EMEs we simulated a sudden stop shock which results in portfolio and banking flows partially reversing, combined with reactions of domestic investors and the current account balance. For advanced economies (AEs) we simulated a foreign currency liquidity shock to resident banking systems and, for a selection of countries, a sovereign debt shock. These scenarios were calibrated on historical experiences, including 40 sudden stop episodes and the 2008 global financial crisis. In our simulations, when faced with such a liquidity shock, we allowed countries to draw upon the full range of resources available to them for that type of crisis: FX reserves where their stocks are adequate, existing central bank swap lines for banking sector FX liquidity shocks, RFA resources where countries are members, with the IMF providing any residual financing need. Based on our simulations, the good news is that the overall resources of the GFSN, including both the IMF’s temporary and permanent resources, appear broadly adequate for all but the most severe shock scenarios. Potential calls on the IMF, after the use of other elements of the GFSN, range up to US$900 billion for the most severe EME balance of payments shock and US$1.1 trillion for the most severe AE sovereign debt shock. The bad news is that there are some individual countries, emerging and advanced, which do not have sufficient resources, given the risks on their external balance sheets. A severe crisis could result in financing needs which are too large for the IMF to realistically fill. In other words, there may be some holes in the safety net. Reducing potential calls on the GFSN: Individual countries can strengthen external balance sheets by, for example, enhancing micro- and macro-prudential frameworks, the use of GDP-linked bonds to make sovereign debt burdens less sensitive to GDP growth, and encouraging more stable FDI and equity flows over riskier short-term debt flows. Securing the availability of GFSN resources: Some countries do not have sufficient access to FX reserves so should further build their stocks. At the global level, the IMF’s lending capacity is set to fall, absent action by members. We would encourage IMF members to commit to maintain the IMF’s lending capacity at its current level. Improving the effectiveness of the current GFSN resources: More effective use of the IMF balance sheet would see broader access to precautionary facilities which can reduce investors’ incentives to withdraw capital and can reduce governments’ incentives to over accumulate FX reserves. And making sure the IMF works closely and cooperatively with the various RFAs which have sprung up can help ensure that their resources are complementary and not substitutes for one another. Edd Denbee and Carsten Jung work in the Bank’s International Directorate and Francesco Paternò works in the International Relations Directorate at Banca d’Italia. Previous Post Is finance a powerful driver of growth? Next Post Central bank digital currency: the end of monetary policy as we know it? I do not believe the Global Financial System is properly protected with the sufficient resources and ability to prevent a Global Financial Crisis/Event that will be worse than 2008. With all the QE’s and What Ever it Take actions to date have been failures and has created even a larger and unstable Financial Bubble, especially in Debt and Malinvestments. Rather than properly rebuilding the Financial system and control the Financial Engineering Products the Central Banks flooded the system with Liquidity which allowed a significant Debt Bubble. Growth based on Debt is not real Growth. I question if the models really factor in all the exposures to the Financial system and the question if the Banks have the required liquid reserves. There is a reason why the Banks are trading at or near their lows. The Market is Bigger than the Central Banks. As noted above, when these Markets Crash and they will, it will larger than 2008 and many will see losses in excess of 2008 and expect trading halts in Markets, as we are now seeing a little bit of this with the UK Property Funds.